For other uses, see Zvartnots (disambiguation). Zvartnots Cathedral (Armenian: Զուարթնոց տաճար (classical); Զվարթնոց տաճար (reformed); literally 'celestial angels cathedral') is a 7th-century centrally planned aisled tetraconch type Armenian cathedral built by the order of Catholicos Nerses the Builder from 643-652. Now in ruins, it is located at the edge of the city of Vagharshapat (Etchmiadzin) in Armavir Province of Armenia. 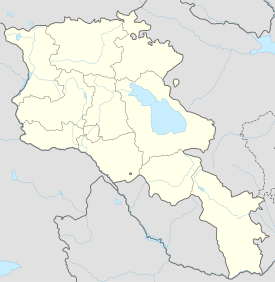 Zvartnots was built at a time when much of Armenia had just recently been overrun by the Muslim Arabs who were progressively occupying the Sasanian Persia/Iran of which Armenia was a part at the time. Construction of the cathedral began in 643 under the guidance of Catholicos Nerses III (nicknamed Shinogh or the Builder). Dedicated to St. Gregory, it was located at the place where a meeting between King Trdat III and Gregory the Illuminator was supposed to have taken place. According to the medieval Armenian historian Movses Kaghankatvatsi, the cathedral was consecrated in 652. From 653 to 659, Nerses was in Tayk and the construction of the cathedral continued under Anastas Akoratsi. Following the Arab occupation of Dvin and the intensifying wars between the Byzantine and Arab armies on the former's eastern borders, Nerses transferred the patriarchal palace of the Catholicos from Dvin to Zvartnots. The exterior church design, featuring basket capitals with Ionic volute mounts, eagle capitals, and vine scroll friezes reveals the influence of Syrian and northern Mesopotamian architecture. Zvartnots remained standing until the end of the tenth century, but historical sources are silent as to the cause of its collapse. A close copy of the cathedral was erected at Ani out by Trdat the Architect under the reign of Gagik I Bagratuni during the final decade of the tenth century. The contemporary Armenian historian Stepanos Taronetsi referred to Zvartnots when describing the church that Gagik I had inaugurated as "a large structure at Vałaršapat [Vagharshapat], dedicated to the same saint that had fallen into ruins." The ruins of Zvartnots remained buried until its remains were uncovered at the start of the twentieth century. The site was excavated between 1901 and 1907 under the direction of vardapet Khachik Dadyan, uncovering the foundations of the cathedral as well as the remains of the Catholicos palace and a winery. The excavations furthermore revealed that Zvartnots stood on the remnants of structures that dated back to reign of the Urartian king Rusa II. Most scholars accept the 1905 reconstruction by Toros Toramanian, who worked on the original excavations, and proposed that the building had three floors. The plan of the cathedral, as drawn by Toros Toramanian. Some scholars, as Stepan Mnatsakanian and most notably A. Kuznetsov, however, reject his reconstruction and have offered alternative plans. Kuznetsov, for example, contended that Toramanian's plan was "constructionally illogical" and insisted that the technical expertise at the time did not correspond to the bold design that the architect had conceived. The interior of the mosaic-decorated church had the shape of a Greek cross or tetraconch, with an aisle encircling this area, while the exterior was a 32-sided polygon which appeared circular from a distance. Some sources claim that the Zvartnots cathedral is depicted upon Mount Ararat in a relief in Sainte-Chapelle in Paris. However, this is not very likely as the fresco was painted more than 300 years after destruction of the church. Together with churches in Vagharshapat (Etchmiadzin), Zvartnots was added to the UNESCO World Heritage list in 2000. A drawing of the cathedral was depicted on the first issue of 100 AMD banknotes and its model can be seen in Yerevan History Museum. The church of St. Gregory (better known as Gagkashen) in Ani (now in Turkey) was built in 1001-1005 and was intended to be a recreation of Zvartnots. The Holy Trinity Church in the Malatia-Sebastia district of Yerevan is modeled by architect Baghdasar Arzoumanian after Zvartnots and was completed in 2003. ^ a b c d e (in Armenian) Stepanyan, A. and H. Sargsyan. Զվարթնոց [Zvart'nots]. Armenian Soviet Encyclopedia. Yerevan: Armenian Academy of Sciences, 1977, vol. 3, pp. 707-710. ^ Maranci, Christina. "Byzantium through Armenian Eyes: Cultural Appropriation and the Church of Zuart'noc'." Gesta 40 (2001): p. 109. ^ Richard Krautheimer. Early Christian and Byzantine Church Architecture, 4th ed. New Haven, CT: Yale University Press, 1986, pp. 322-23. ^ Maranci. "Byzantium through Armenian Eyes", p. 118. ^ (in Russian) Kuznetsov, A. Тектoникa и Конструкция Центричecких Здaний. Moscow, 1951, pp. 110-114. Gombos, Károly (1974). Armenia: Landscape and Architecture. New York: International Publications Service. ISBN 963-13-4605-6. Maranci, Christina (2001). Medieval Armenian Architecture: Constructions of Race and Nation. Louvain: Peeters Publishers. ISBN 90-429-0939-0. Wikimedia Commons has media related to Zvartnots. This page was last edited on 6 October 2018, at 11:57 (UTC).